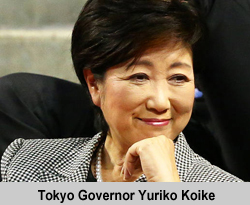 1 August 2016: Put-upon voters in Tokyo went to the polls on 31 July 2016 to elect a new Governor and overwhelmingly chose their first female city leader, former cabinet minister Yuriko Koike. Koike, who enjoyed a commanding lead in polls through the campaign, was chosen to succeed Yoichi Masuzoe, who resigned in June after his financial scandal engulfed preparations for the Tokyo 2020 Olympics. Koike was elected as an independent following a bruising campaign against her own Liberal Democratic Party (LDP), which instead ran former interior minister Hiroya Masuda. Voters went to the polls to elect their third governor since the last scheduled elections held in 2011, when maverick nationalist Shintaro Ishihara was elected to a fourth term before his grandstanding resignation just one year later. Ishihara’s anointed successor, Naoki Inose, lasted only one year in the job before being forced out by investigation over a loan scandal during his 2012 election campaign. Former cabinet minister and TV pundit Yoichi Masuzoe, who also enjoyed an on/off relationship with the ruling Liberal Democratic Party, fared little better when he too left the metropolitan administration collapsing under accusations of sleaze over political fund abuse and personal spending. Running against Koike, 64, in the crowded race her principal challengers were Hiroya Masuda, 64, backed by the LDP and Shuntaro Torigoe, 76, supported by a joint slate of centre-left opposition parties. Masuda previously served as Japan’s minister of internal affairs and communications for one year in 2007-08 and also as a noted reformist governor of the Iwate prefecture. Torigoe was an early front-runner in the race on account of his popularity as a TV journalist but stumbled when a weekly tabloid ran accusations concerning his private life. Koike failed to attract the backing of the city’s LDP chapter for her candidacy on account of their preference for Masuda, who retaliated by suggesting she could dissolve the Tokyo Assembly on taking office in order to give Tokyoites some fresh faces. During the campaign all three main candidates were taken to task over their campaigns being focused on personality rather than voters concerns over Tokyo’s lack of affordable childcare and support for the elderly, in a city where workers increasingly struggle to balance such family commitments. A female governor, following a bruising campaign where she clashed against elderly veteran assembly members and even Shintaro Ishihara himself (who dubbed her a “caked-up old woman past her prime”), will be refreshing in a metropolitan administration where just 25 of 127 city assembly members are women. In 2014 the largely anonymous city assembly achieved global infamy when one female member was reduced to tears under sustained sexist heckling during a session investigating childcare in the capital. Koike has served in both houses of the Japanese parliament (National Diet) and was, as environment minister from 2003 to 2006, closely associated with flamboyant LDP prime minister Junichiro Koizumi during his terms of office (2001-2006), before being appointed as Japan’s second ever (and only female) Defence Minister (a post previously downplayed under the ‘pacifist’ post-war constitution) in the first administration of Shinzo Abe. She resigned from her second cabinet post after just 54 days in office, though she later contested the 2008 LDP leadership election against Taro Aso and was even floated as a desperate stop-gap ‘first female PM’ when his administration collapsed a year later and the party unsuccessfully sought to stave off its first ever election defeat since its 1955 founding.